Our lives now include living at one of the nicest senior communities in the USA. Rossmoor in Walnut Creek, CA. We will still travel in the RV but not full time. For ladies that graduated college in 1970, I think we look pretty good! Russ, Shadow and I have been in DC area for well over a week. We have moved from Maryland site to Virginia site, and we have taken quite a lot of trips into DC both with Metro and by car. Yesterday, however, was a very special one for me as we met my college Kappa Kappa Gamma friend, Jane. We have only seen each other at one reunion, but that feeling of comfort with those special people in your life was right there. Jane came up with a spectacular idea and had us meet her in Middleburg, VA in the rolling green fields of the polo country and farms. The town itself is very beautiful with Rock buildings and great Antique stores. 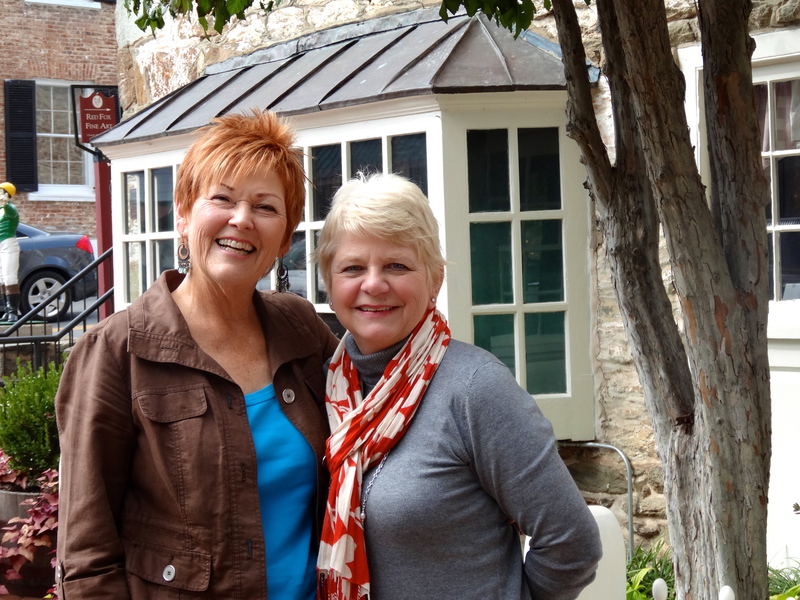 We met at an old Inn for lunch-Red Fox Inn, and we just hugged and caught up. Both of us have been in teaching and special education-her time has been in Fairfax. Her younger sister, Midge and my sister Karole also became friends in college and Midge was in Karole’s wedding. Jane has been a big help in our time here, keeping me informed by e-mail and phone of what to see and do and how to get there. You know it is stressful getting to places, especially when Russ does not walk for a long time-he is actually doing remarkably well, but is in pain. HISTORY for those interested. The town was established in 1787 by American Revolutionary War Lieutenant Colonel and Virginia statesman,John Leven Powell. He purchased the land for Middleburg at $2.50 per acre from Joseph Chinn, a first cousin of George Washington. It had been called “Chinn’s Crossroads”, and was then called Powell Town. When Leven Powell declined to have the town named after him, the town was called Middleburgh, and later, simply Middleburg. The village is located midway between the port of Alexandria and Winchester, Virginia, on theAshby Gap trading route (now followed by U.S. Route 50). In 1863, Middleburg witnessed two skirmishes during the Gettysburg Campaign of the Civil War. From the early 1900s, Middleburg began welcoming visitors who participated in foxhunting and steeplechasing. The village soon earned a reputation as the “Nation’s Horse and Hunt Capital”, attracting prominent visitors from across the U.S. Middleburg is the home of the 15,000-square-foot (1,400 m2) National Sporting Library research center for horse and field sports, which publishes Thoroughbred Heritage on the Internet. A new addition is being made to include an art gallery and museum. In 1961, civil rights activists pressed John F. Kennedy on local segregation issues during his residency outside town. The Middleburg Historic District, comprising the 19th-century center of town, is listed on the National Register of Historic Places, as is the Red Fox Inn, the oldest building in town, and billed as the oldest continually operated inn in the U.S.